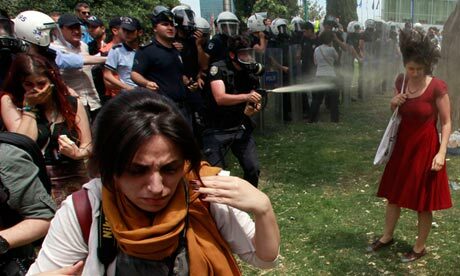 What began in late May as part of efforts to stop the cutting down of trees at the popular Gezi Park, to build a mall in the last green space in the city center of Istanbul Turkey, has rapidly morphed into a large scale protest about the erosion of rights and heavy handed government brutality. Demonstrations against the violence and indiscriminate use of teargas meted out by police have taken on a life of their own. Demonstrators are calling for Prime Minister Recep Tayyip Erdogan's resignation and communicating via social media while heavily censored local media play down the scale of protest. 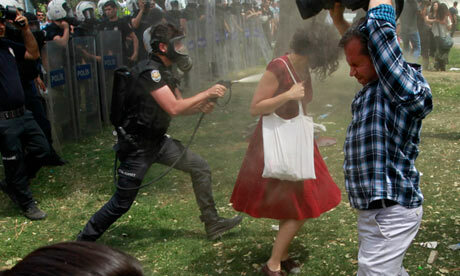 Last week an unlikely “Woman in Red” became the symbol of Turkeys protest as images of heavy handed police action showing a smartly dressed woman being sprayed with teargas by a riot policeman during protests in Istanbul's Taksim Square spread on social media around the world. The woman identified as Ceyda Sungur told Turkey's TV 24 that she is uncomfortable about her new fame. She doesn't want to be an icon of a movement saying "There are a lot of people who were at the park and they were also tear-gassed," adding "There is not (a) difference between them and I." The images of a woman in a red dress walking in public have touched a chord with other women in the region too, with many women questioning why they should not be free to wear such attire in their own countries. Amidst allegations of indiscriminate police use of toxic forms of teargas and elderly passers buy being targeted with water cannons, Swiss TV station RTS showed images of women inspired to wear red clothing by the “women in Red” being targeted by police in subsequent gatherings and rounded up while walking along the street. 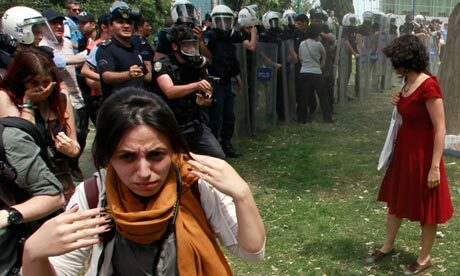 Women are now finding themselves on the frontline of Turkey's mass anti-government protests. Protesters say Turkish Prime Minister Recep Tayyip Erdogan is forcing his conservative, Islamic values on the mainly Muslim but staunchly secular nation. One of the protestor’s actress Sevi Algan, 37 says "We are the women Erdogan would like to see staying at home." Many of the women happily admit they are accidental activists who never would have guessed two weeks ago that they would be pitching a tent in the epicenter of nationwide civil unrest. But now these young Turks, many of them students, lawyers, teachers and office workers, easily account for half of the thousands of demonstrators in Gezi Park and nearby Taksim Square - and they have taken to their new routine with gusto. They spend hours under the park's sycamore trees debating their cause, take part in all-night singing and dancing sessions and, when necessary, stand shoulder to shoulder with football fans on guard against police action outside the park's police-free zone. 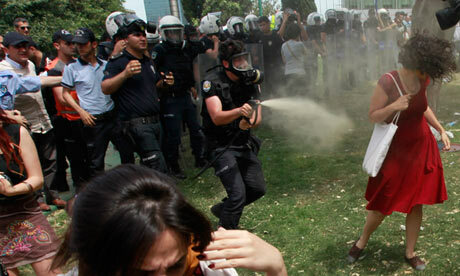 A Turkish riot policeman prepares to use teargas against a woman as people protest against the destruction of trees in a park brought about by a pedestrian project, in Taksim Square, Istanbul. Istanbul's police chief had said his forces would only use teargas as a last resort. But the images seem to show the officer targeting an unarmed woman. The woman's hair is blown upwards as she turns away from the officer. The officer closes in on the woman. The officer continues to use teargas as the woman turns away. 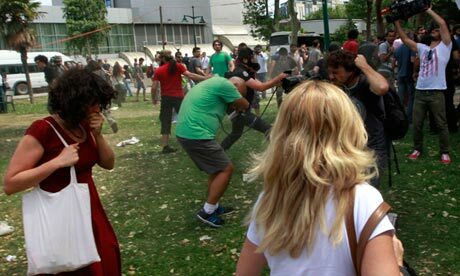 The woman covers her mouth as the officer goes on to spray the crowds of demonstrators behind her.